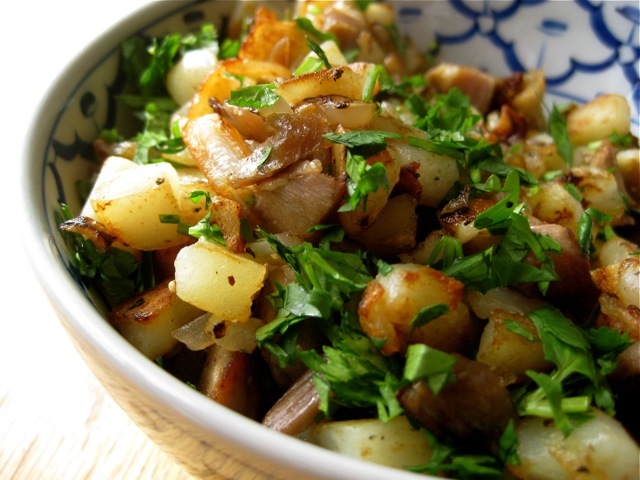 If you don't have leftover cooked potatoes, dice a raw potato and boil the chunks in salted water for five minutes. Drain and use in the recipe. Add the protein and onion and continue cooking until everything is well browned, 5 to 10 minutes more, adding another tablespoon of butter if necessary. Season to taste with salt and pepper, and serve with poached or fried eggs and minced herbs.